The dragons of Krynn are creatures of tremendous passion and emotional strength. The fires of their hearts drive them to great acts of good and evil, and leave great marks upon the world. In some cases, even the emotions of a wyrm’s death can have a tremendous impact on the world. While the metallic dragons often face death with sorrow and regret, feelings such as blind rage or bleak despair rarely take hold of them in their last moments. Chromatic dragons, though, will many times burn with such dark feelings as they die, seething with hatred at the world or despair over their fate. If the dragon is passionate or strong-willed enough, it may become an undead creature as its soul refuses to let go of the world and the forces of darkness reward it with a mockery of life. In many cases, though, the dragon simply dies and moves on to its final fate–but not without leaving something behind. If the dragon’s negative emotions are strong enough, but it doesn’t become an undead creature, the negative mystical energies may create a ‘shade’ of the dragon. This mystical simulacrum reflects the state of the dragon’s heart at the moment of its death, and retains traces of its personality and even memories. In most cases, it can only be perceived by those with magical gifts at their disposal, and the small spark of mystical energy that makes up the shade is only enough to allow it to communicate to the sensitive. (The conversation of such dragonshades tends to be unimpressive, being simply a repetition of the thoughts and emotions racing through the dragon’s mind when it died.) Though occasionally mistaken for a spirit or undead creature, these shades lack free will or real souls, and are simply dark echoes of a dying evil wyrm. They tend to last for only a few years or decades before fading away forever. In most cases . . . If enough shades are created within a short amount of time, they will often coalesce into gestalt dragonshades, as the similar emotions call to each other. The mystic energy combines, the emotions reach a deeper intensity, and the memories become a mind-shattering yet somehow unified chaos. Even the greatest of these composite dragonshades, though, remains separated from the world, unable to do anything but unleash the occasional wave of mystic energy in visions, emotional ‘flares’, or poltergeist-like manifestations. They do, however, provide tinder that can be ignited by the right spark. maintain the dark emotions that created the shades at a fever pitch, the shades will actually be drawn into the body and mind of the dragon. Their emotions and preserved thoughts enter its own mind, while the mystical energy heals and transforms the dragon. Thus, a shadow dragon is created, transformed by the negative emotional and mystical energy into a shadowy image of what it was, and infused with great power and knowledge. If the shades that infused the catalyst dragon were numerous or intense enough, the dragon may even grow in size and might, becoming the equivalent of an older dragon overnight. Like all other dragons, shadow dragons can grow in power over time–but in a manner different than most. Once a shadow dragon has come into existence, any further shades that are created will usually be drawn to it and absorbed into its mass. These creatures are often studies in contrasts. The negative emotional energies that created both shades and catalyst make them obsessed with destroying or thwarting the person, item, or event that caused their creation. 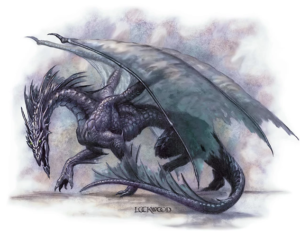 The vast knowledge brought into the shadow dragon upon its creation, and harvested from other shades, though, also makes it remarkably cunning and subtle; such wyrms are often some of the intelligent beings and conniving manipulators on Krynn.